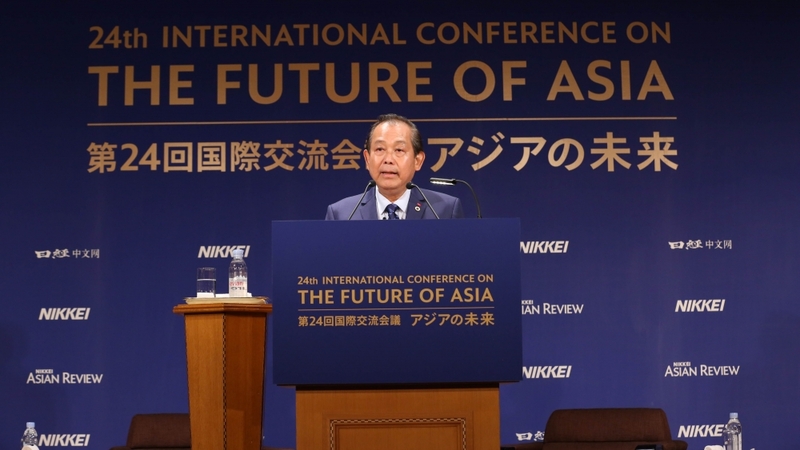 Vietnam pledges to maintain stability to ensure the interests of foreign investors in Vietnam, Vietnamese Deputy Prime Minister Truong Hoa Binh emphasised at the 24th International Conference on the Future of Asia, held in Tokyo, on June 11. The Deputy PM specified three areas of stability including stability in politics-security, stability in policies toward foreign investors, and the stability in renewal policies. The Vietnamese Government will continue to complete its legal and policy system related to investment in a consistent, transparent and foreseeable manner which facilitates investors, Deputy PM Binh noted. He stated that the government will also make efforts to improve law enforcement, while increasing constructive dialogues with investors to remove any obstacles they may encounter. The Vietnamese government official also talked about the relationship between Vietnam and Japan and thanked the Japanese Government for their great support for Vietnam over the past few years. He expressed his hope that the bilateral relationship would continue to thrive in the future, while valuing the role of Japan in the development of the region and Vietnam in particular. Deputy PM Binh noted that Japan has resumed its role as the largest foreign investor in Vietnam with a total registered capital of over US$9 billion and the two-way trade revenue between the two countries has reached over US$33 billion. Opinions and proposals by the Japanese community are always recognized and supported by the Vietnamese Government, the Vietnamese Deputy PM added.